They best enjoy playing „live“ and „unplugged“ at parties and weddings that can, providing keen dancers, be extended „eternally“. On their second CD, after having played for 30 years, they show their great variety from traditional interpretation to wonderful new compositions. Much fun with this topical folk music from Switzerland! The Stubemusig is comparable to a front porch band playing traditional country music. Personal remarks – by Karl Johannes Rechsteiner. My heart was beating very fast. I had just received the school report from my teacher. The marks in chemistry and French were insufficient. What would my parents say, who had to sign the report? And a voice inside me sneered, "That's the result of your laziness!" However, I calmed down quickly and took the report to my father. As soon as he had seen the marks, his face lit up. He had discovered top marks at singing and music. Irrespective of how badly us children did in the main subjects, the world was alright if we excelled at music. One day Karl senior looked at his sons: Christoph played the fiddle, Niklaus the cello, Karl junior the recorders. And Karl senior saw that it was good. His siblings had received a solid musical training. This could even be turned into a proper Appenzeller String Band. If only there was a hammered dulcimer! So he, homesick for his beloved original county, bought one for his 50th birthday himself. He travelled to the main square of the town of Appenzell, went to see the legendary hammered dulcimer maker, Chliine Fuchsli (small fox), and bought one of these ancient instruments with the 138 strings. A new life had begun. At the beginning we played in the sitting room at home – after mother had refreshed us in the kitchen with soup, salad, goulash and trifle. For family occasions we practised a waltz, tried a reel, arranged a jig. And with each party our repertoire grew. Then we made it internationally: The first public performance was for father's train drivers' union! We left our home and tried the wide world as a Stubemusig. Thus began, in 1976, the story of our Stubemusig as a folk music group of four brothers, with the eldest member being their father. Niklaus was just past ten years, Christoph in his teens, and myself an adolescent with long hair. It was the time of the traditional folk festivals. The women wore lilac dungarees, the men put up with their feminism but grew beards to protect themselves and burnt incense sticks that smelled like pachouli. And the archaic sound of our folk music enchanted us musicians – a fascination that has continued to the present day. A party against the tearing down of houses? A case for Stubemusig Rechsteiner. A solidarity occasion for the liberty of the Autonomous Youth Centre Reithalle? Another case for Stubemusig Rechsteiner. A concert in favour of the Alpen-Initiative (whose aim was to transfer the lorry traffic through Switzerland onto the rails)? Another case for Stubemusig Rechsteiner. Whenever there was a need for folk music in Berne outside the traditional folk mafia, it was a clear case for Stubemusig Rechsteiner. Once between two waltzes even President Kurt Furgler peered happily at the lovely world of this family quartet – just to lose his composure and become red in his face when we young musicians started to argue with him about the youth movement of the 1980s. What a contrast to the joy of South Africa's First Lady, Zanele Mbeki, who – a few years later – enjoyed our tunes and the melting cheese fondue at Café Hugo in Oberdiessbach. This was just as unforgettable as the gig at a party for people with a handicap, who were frantically dancing to our rhythms in their wheelchairs on the floorboard. Folk music does not strive for edelweiss jackets nor after shirts of the same kind. It should not sound as if everybody was dressed equally. Small golden ladles hanging from their ear and the yellow pants worn by Appenzeller farmers are lovely. But city people like us would only be disguised in them. Even if we sometimes dream of a big hit of the "Original Rechsteiner Boys", it is not the stale nine-to-five megahits of the traditional music industry that inspire us. 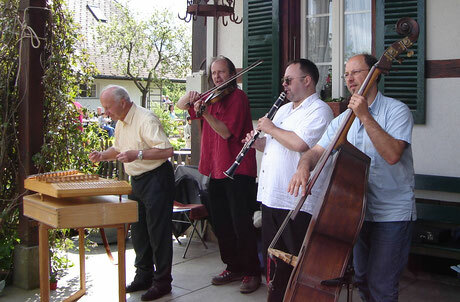 All of us four Rechsteiners do not only play folk music but have made other experiences, too. Be it in a church choir or as a member of an unconventional carnival brass band, or by trying rock, swing, loud punk or free jazz. However, we always come back to the unique sound centred around the hammered dulcimer. We like folk music, woven like a carpet with strings from different worlds and times. Long ago the mazurkas from eastern Europe arrived in Appenzell as guests but have stayed under the name of Masolke. And the sad melody of the Bernese Guggisberg Song has amalgamated with the tones in minor of the yiddish music. What remains? Two CDs by Stubemusig Rechsteiner until now. Many colourful family photos. Profound memories of numerous high moments (often in connection with weddings). The joy of successful band compositions of our own. The fun of playing together. People dancing in front of our inner eye. Tunes and rhythms still sounding fresh after nearly 40 years. And – the habit that I continue checking the music marks of my kids first.